The Super Yacht Sub 3 was designed to be carried by large yachts without alterations to decks and cranes. The submarine is light enough and takes up little space for easy launch and retrieval. 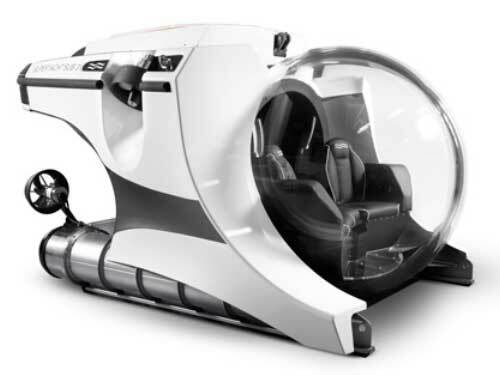 This submersible holds three people in air conditioned comfort with all the safety gear needed for safe diving. The submarine can be purchased intitially to dive to 100 meters and can be upgraded to 200 and 300 meter dive depths. Go to the U-Boat Worx page to learn more about the Super Yacht 3, Super Yacht 3 LX, and other submersibles by U-Boat Worx. Also from U-Boat Worx, the C-Explorer 3 for diving to 300 meters.